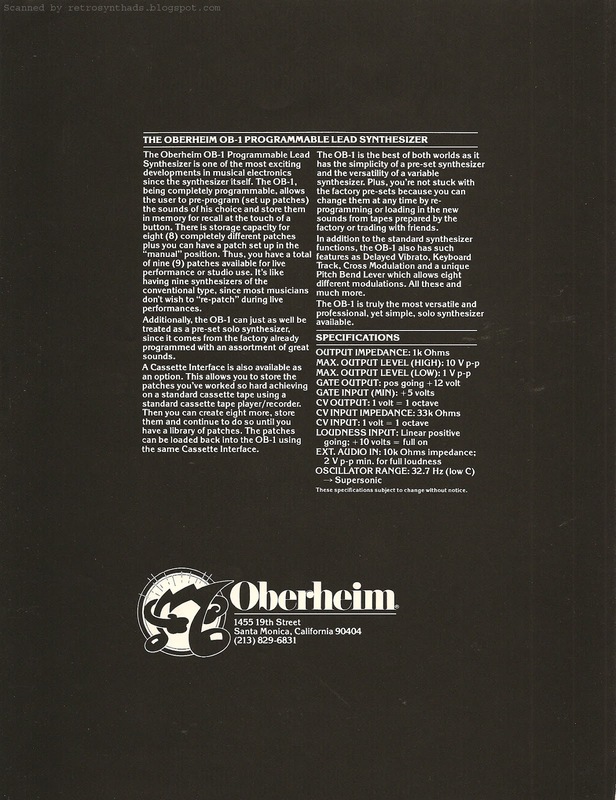 Oberheim OB-X "Evolution of a classic" 2-page black and white advertisement from page 42 and 43 in the March 1980 issue of Contemporary Keyboard Magazine. 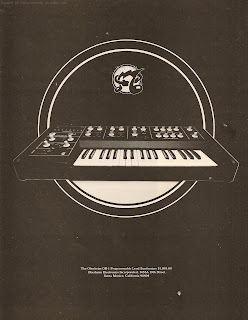 Another awesome Oberheim ad. And, if you can believe it, I think this is Oberheim's FIRST two-page advertisement in CK - ever. But at least this got centerfold action. 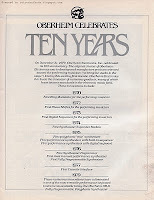 Looking back at Oberheim ads, "Evolution" has been one of their big themes. Today, that word can unsuspectingly take on an uncomfortable tone and can be controversial just to include in ads - or elsewhere for that matter. We tried to use "Evolution" as the title for one of our recent annual reports and the discussion was long and heavy on whether that could work against the organization. In the end, we decided it was better to be safe than sorry, and stayed away from the word. But back in the 70s/80s, "evolution" was still just a relatively innocent word that had a neutral or even positive scientific feeling to it, separate from anything to do with religion. No uncomfortable awkwardness around the marketing table wondering if someone in your audience may have taken their kids out of school because the teacher was going on about that myth of evolution. 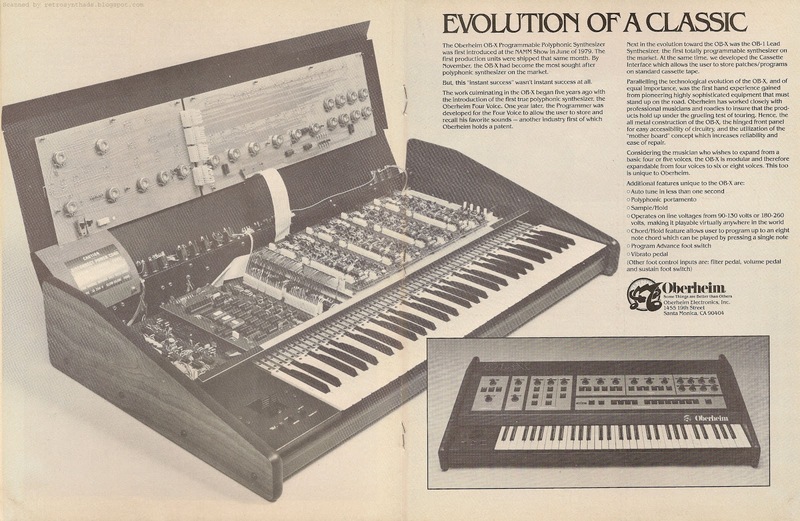 Anyways, point being, this isn't the first time Oberheim made "Evolution" a theme in their marketing campaign. 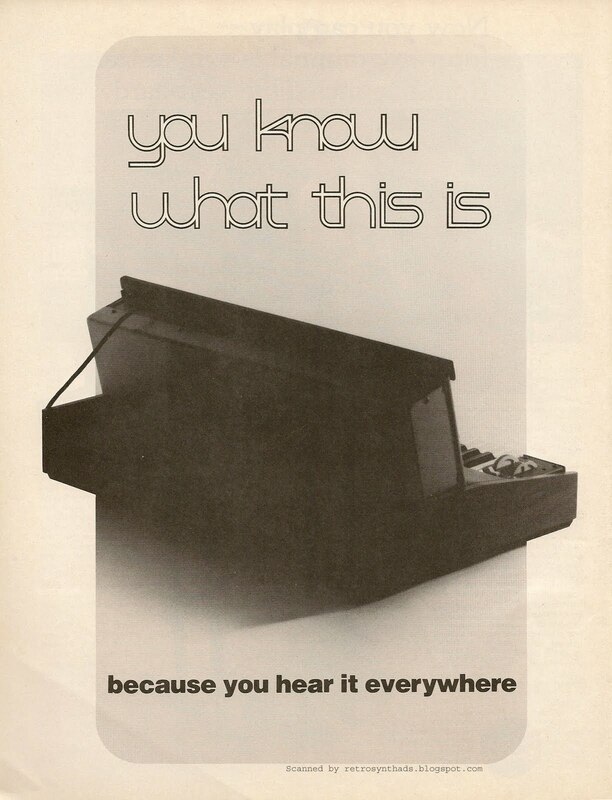 They used the word to good effect back in 1977 in an ad that featured the SEM's evolution, from a tiny little box to what eventually became the dual manual Eight-Voice (even including a picture of it!!!!). And now they are continuing on with the theme in this two-page ad, this time starting with the Four Voice and Programmer. 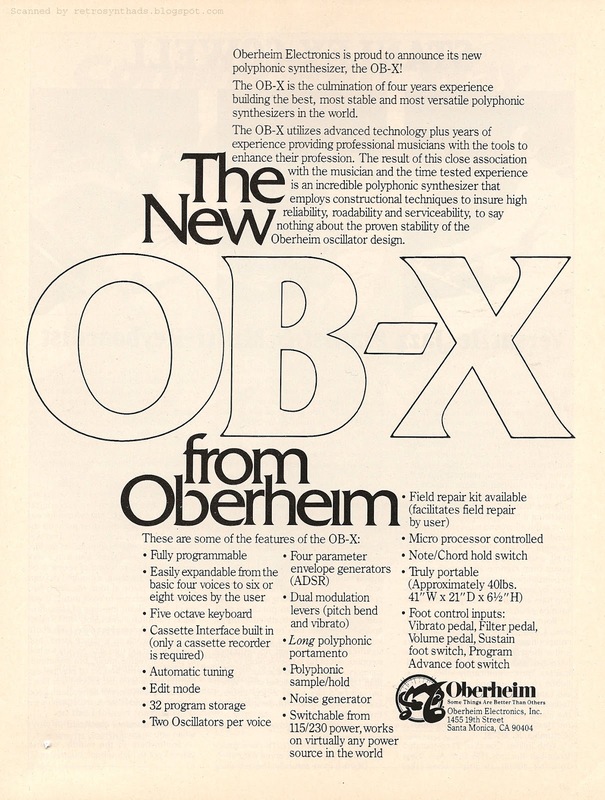 We don't get a cool diagram or flow chart, but the ad-copy does a good job of promoting Oberheim's continued technical progress into the OB-X and OB-1, and also throw in a mention of their Cassette Interface for storing patches/programs on tape. Interestingly, Oberheim doesn't stop there with the ad-copy. In fact, they spend even more ad-copy real estate on another aspect that was becoming more important with polyphonic synths - durability for touring. More technology = more that can go wrong. Great insight into the times. I'm sure many musicians thought this was the ultimate polyphonic machine to take on the road, so Oberheim really tried to promote it's increased reliability and ease of repair. This theme is magnified by the main photo too. The largest photo in this ad isn't a front panel shot - something that would look gorgeous in a two-page spread. Nope. The money-shot in this ad is an OB-X with its front panel lifted up, showing the ease with which you can get into the machine. In fact, this photo actually takes up more than 50% of the two pages. Bold move, Oberheim. Bold move. The best part is that you can easily shrink this photo down to that small space on the right half of the page, and the message is still there in a one-page ad format. Nice. And, near the end of the ad-copy they take a small dig at the Prophet by including the line "Considering the musician who wishes to expand from a basic four or five voices...". Bolding is mine. Nothing like calling the Prophet "basic". Another insight into Oberheim can be found in the first sentence in the ad. They mention that June 1979 NAMM show right at the beginning. I mentioned the NAMM show, and the CK article that followed, in the OB-X's introductory ad that I posted. And the fact that Oberheim mentions it again in this ad must have meant that this particular show was *really good* to Oberheim. It was obviously a successful show for them and the OB-X launch, and I don't blame them for milking it for all it's worth. Oh - back to the evolution theme for a second. 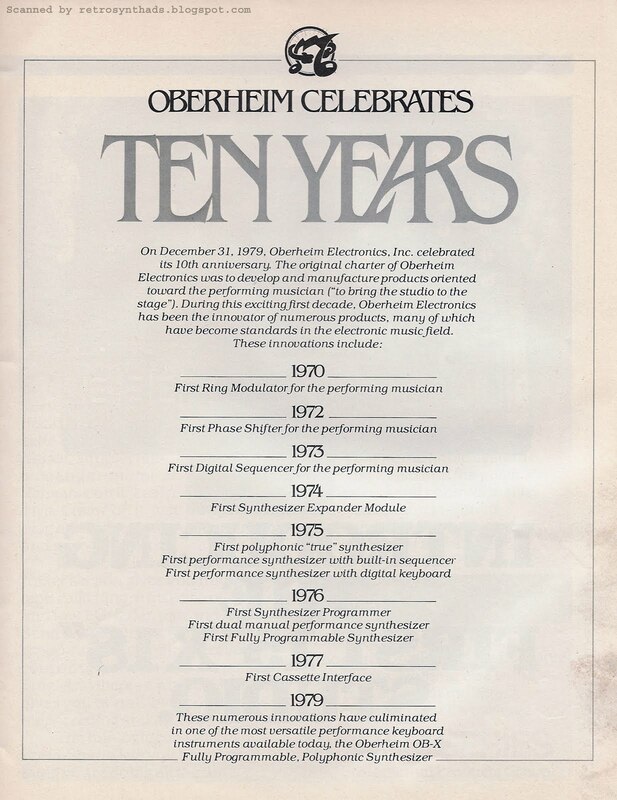 The month after this ad appeared, another Oberheim ad looking at the evolution of their technology appeared in the April 1980 issue of CK that celebrated Oberheim's ten year anniversary. That last one was a great summary of Oberheim's accomplishments too.Yum. Oberheim OB-1A and OB-X "A family that plays together..." 1-page black and white advertisement from page 43 in the October 1979 issue of Contemporary Keyboard. I actually posted this ad waaaaaay back in February 2009 (over three years ago!) but wasn't commenting on ads back then. Now, since this ad is kinda just sequentially fitting into the Oberheim ads I've been posting lately, I thought it deserved a bit of attention. The main reason this ad deserves attention is that stylized hand-drawn Oberheim logo and logo-type in the bottom right hand corner. Blows me away. *THAT* version of the logo belongs on a t-shirt. Somebody get on that and I'll be first in line to buy one. 4 true! The second reason this ad deserves a second look is that readers finally got to see a "final" OB-X. What I mean is (and like I pointed out in my last blog post on the OB-X) up until now most readers of CK had only seen what I called "prototype" versions in CK. 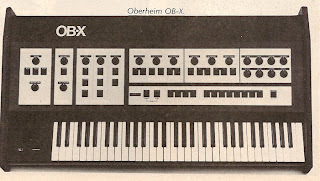 These variations included different versions of the OB-X and Oberheim logos spread about in various locations on the front of the synth. But the photo in this ad finally captures the real OB-X. Delicious. Finally, this ad deserves more attention because I had not realized just how rare the OB-1A was. 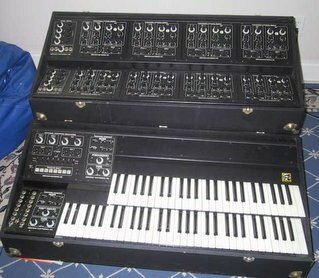 I tried to find some quick information on the differences between the original OB-1 model and the OB-1A using Google, but the top hits I got in Google Images were for a bunch of other Retrosynthads' posts (yay! ), and the Web search top results brought up only a few significant links. 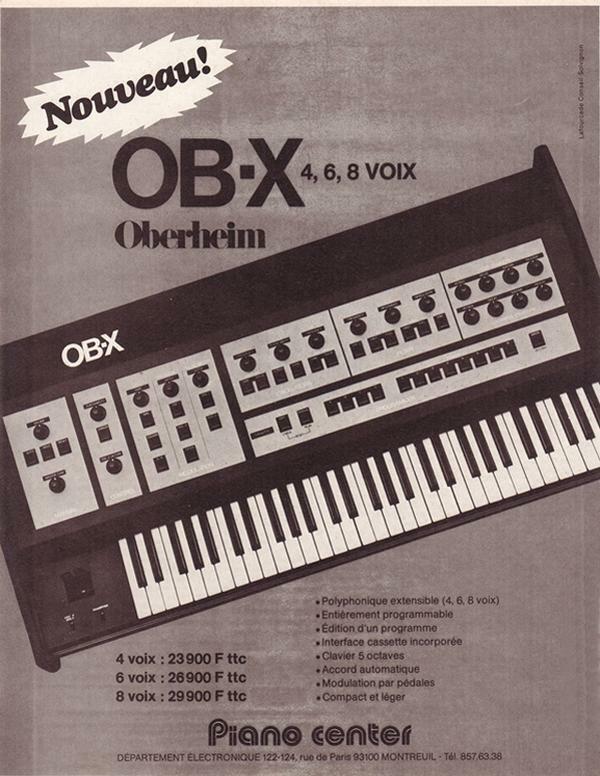 The main noticeable difference is, as the ad states, the "new improved chassis design and graphics", updating the synth's looks to fit in well with the newest direction of the Oberheim look - the OB-X. As much as I'm in to the color black of the original, I really like the updated design. I haven't played on it, so can't tell if it is more user-friendly to the eye in terms of zero'ing in specific knobs and dials for tweeking sounds, but it sure looks like it would be. The ad also states a few other updates from the original OB-1 design, including switchable 115/230 volt power and vibrato input pedal. Meh. As for other tidbits about the OB-1A from around the Web that may give hints to differences between the two synths, two pages in particular popped out at me. The first was the Oberheim Files page on electrongate.com. I can't recall visiting this page before, but it contains a wack of great info including wiring block diagrams for both the OB-1 and OB-1A. And they do look slightly different. Now, this doesn't mean they *are* different. Just thought I would point it out. The other page I found on the Web was (of course... :) a MATRIXSYNTH OB-1A auction post from April 2008. One of the great things about his auction posts is that he adds the photos to Flickr, where we get to see a lot more close-up photos of the synth. It's not a lot of photos, but I'll take what I can get when it comes to the OB-1A. Yum. If you haven't noticed, I'm kinda a fan of the OB-1 and its kin. But all is not perfect. The biggest annoyance I have with this synthesizer is that although the back of the unit indicated that it was an OB-1A, it was still labelled "OB-1" on the front of the synth. I will always think of them as two different beasts, even if the differences are slight. Others aren't as convinced as I am that these two products should remain totally separate. For example, Oberheim Electronic's Wikipedia page labels a photo of an OB-1A as an OB-1. Even my fav, Vintage Synth Explorer, doesn't admit to its existence on their timeline or the OB-1 page. Yet. Whether you call it an OB-1 or OB-1A, it won't change the fact that this ad only appeared twice, October 1979 and February 1980, and then this was the last readers would see from the OB-1 in ads. I miss you already. Lots. 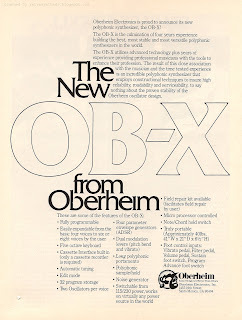 Oberheim "New OB-X" introductory 1-page advertisement from page 29 in Contemporary Keyboard June 1979. What the...? Do you see it too? Or... more accurately... do you *NOT* see it too? At first I'm thinking: "Oberheim, this is messed up". No photo? Really - you are introducing a new synth, and no photo? I was almost angry at first. My mind was racing to try and figure this one out. Why would Oberheim choose not to include a photo? 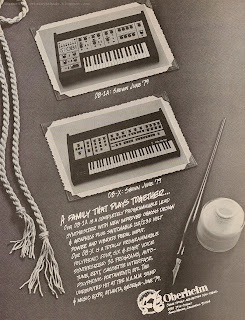 Well, one reason a photo may not have been included would be that the ad would theoretically need to be submitted a month or two before the June issue was printed, and it could very well be that the exterior look of the synthesizer wasn't quite ready yet. But a photo *was* ready by the time the July issue printed - because even though this ad appeared in the June and July 1979 issues of CK photo-less, readers could find a photo of the instrument in Contemporary Keyboard in the July Spec Sheet section. "Oberheim Polyphonic Synthesizer. The OB-X is a programmable polyphonic synthesizer available in either four-, six-, or eight-voice configuration. It can store 32 programs internally. It can also be linked with a cassette tape recorder for further storage of programs. The unit is microprocessor-controlled and its features include a 5-octave keyboard, automatic tuning, edit mode, polyphonic portamento, polyphonic sample-and-hold, a noise generator, dual modulation levers, ADSR envelope generators, two oscillators per voice, and switchable 115/230 volt power. The unit also includes an array of footpedal control inputs: vibrato, volume, filter, sustain, and program advance. Oberheim is also offering a roadie kit for maintenance on the road. Prices are: four-voice, $4,295.00; six-voice, $4995.00; eight-voice, $5,495.00. Oberheim, 1455 19th St., Santa Monica, CA 90404." The Spec sheet is pretty much a carbon copy of the ad, except that the ad actually includes things this Spec Sheet doesn't - in particular the size and weight, and it's Note/Chord hold switch function. Another reason it may not have included a photo is that it might help build intrigue in the instrument. 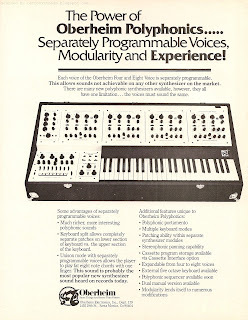 Previous to this ad, Oberheim had been pushing two extremely different looking machines - the prehistoric-looking Four/Eight Voice synth, and their first programmable synth, the OB-1, and any new mysterious instrument Oberheim would launch would probably follow the evolution of one of these two paths. Intriguing! But I'm still doubting that theory. Finally - it could be they didn't want to steal thunder from the Summer NAMM show that took place in June at the Atlanta World Congress Centre. The OB-X got fairly high billing near the beginning of the Contemporary Keyboard article that featured the findings at the show - listing off a few of the voice and programmability features as well as a price range from $4,200.00 - $5,400.00. Notice that price range is slightly different from the prices quoted in the July CK Spec Sheet promo. But, what really makes this NAMM article interesting is that they include a photo of the OB-X. Although NAMM was in June 1979, the article didn't make it into the magazine until October 1979, but the instrument in the photo is definitely NOT the finalized version of the OB-X that I'm familiar with. This instrument had an OB-X logo in a very 'normal' font. Not that awesome Oberheim font we all know and love. And, when I noticed this difference, I went back and took a look at the photo of the OB-X included with the Spec Sheet - and it too was different from both the NAMM version and the final version. It only included a large Oberheim logo in the top center of the front panel. 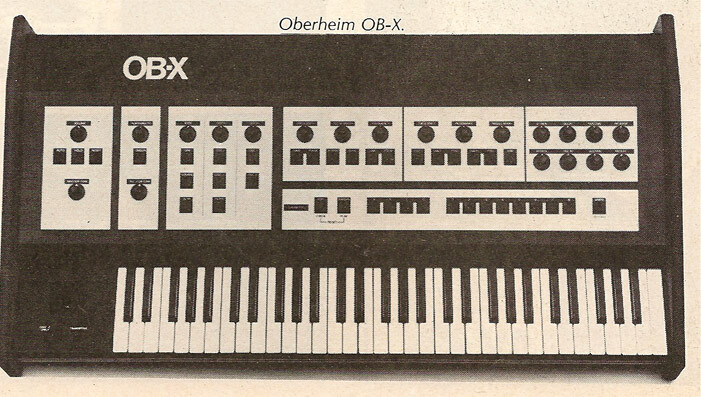 So, these are both different from what I call the "finalized" version of the OB-X, with the classic OB-X logo in the top left corner, and the Oberheim logo in the bottom right of the front panel. I've included photos all three versions below with a bit of descriptive text to help explain these differences. Notice OB-X logo in top right in 'normal' font. Boo! So, it does look like the early photos are prototypes of some sort. But, there may be more than a few of these early prototype instruments out there with the early look. 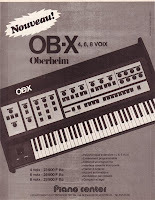 For example, a photo of the OB-X similar to the NAMM photo did make it into this early French ad. Maybe it was taken at NAMM, or the photo was provided to distributors for early ads...? but I'm not convinced that would be the case. Especially if Oberheim wasn't using the photo in their own ads. No matter, in the end, Oberheim was definitely better off leaving a photo of the instrument out of this intro ad. The final version of the synth with that delicious Oberheim OB-X font in the top left of the instrument and the Oberheim logo on the lower right side of the front panel is definitely the yummiest of the bunch. 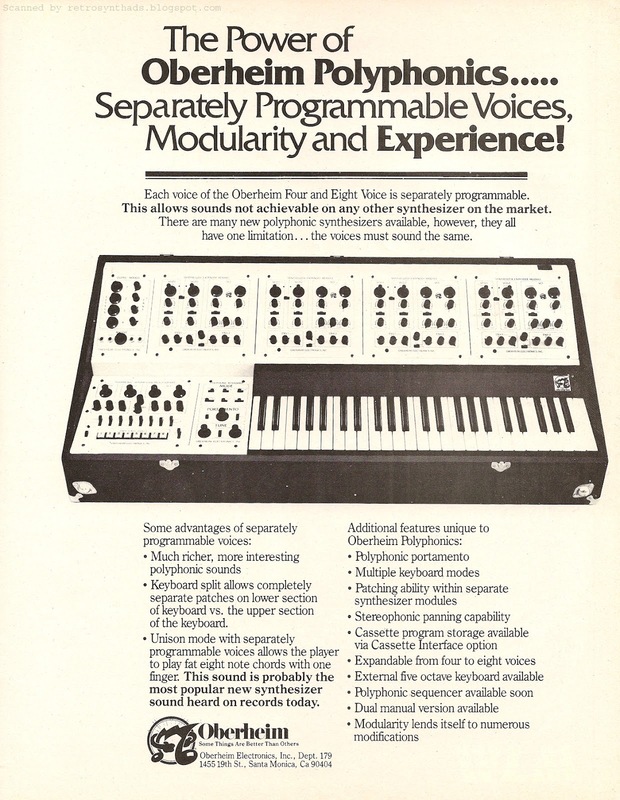 Oberheim Four- and Eight Voice "Power of Polyphonics" 1-page advertisement from page 49 in Contemporary Keyboard March 1979. This was a fitting end to SEM family appearances in CK ads. Much like the Oberheim logo is throwing punches (or dancing aggresively :), this advertisement's purpose was to fight back against the growing tide of competitor's polyphonic synthesizers that were appearing on the market. It's a quality advertisement that is well-designed, well-written, and summarizes nicely all that is great about this series of instruments - it's separately programmable voices and modularity. Unfortunately, this modular format also made the synth a little too bulky and a little prehistoric looking. A big PLUS in my books but back in those technologically-driven days, could have be seen as a bit of a negative. The ad ended up appearing in the March and May 79 issues. And that was that. The end of an era. Okay - technically speaking it was the last time we saw this synth featured in an ad. But it wasn't the last we saw from the SEM family in the magazine. In this ad, it specifically states that the keyboard for the synth was available in two versions - the first being a single manual that could be expanded with an external five octave keyboard, and the second a dual manual version. Unfortunately, the photo chosen for the ad was for a single manual Four-Voice. Probably for space reasons. Understandable. But I would have been much more impressed if they had included a dual manual Eight Voice photo. *That* was a beast. Fortunately, for avid Contemporary Keyboard readers, the magazine did happen to include a small photo of a dual manual Eight Voice months after the ad ended - in the August 1979 Spec Sheet section when they chose to give Oberheim one last print-party. "Oberheim Dual-Manual Synthesizer. The unit consists of eight synthesizer expander modules grouped in one case. They are used with dual keyboard, keyboard controllers, and eight-voice polyphonic programmer situated in a separate case. Each keyboard has its own keyboard electronics. The top manual has a four-voice configuration, and the bottom one has an eight-voice configuration. The upper keyboard is four-octave, the lower keyboard is five-octave. The lower keyboard electronics act as master for pitch-bend and overall filter control. Switching is: Mode Four - four voices on the upper keyboard and four voices on the lower keyboard; Mode Six - two voices on the upper keyboard and six voices on the lower keyboard; Mode Eight - eight voices on the lower keyboard. Keyboard electronics work for the most part independently on one another, enabling the user to have several voices in unison creating a complex sound or chord on one keyboard while playing polyphonically on the other. Also included is CV-IN and CV-OUT for all eight modules. Price is $12,500.00. Oberheim Electronics. 1455 19th St., Santa Monica, CA 90404." Often you will see the dual manual Eight Voice described on the Web as "custom made". And they sold so few that maybe it would technically make each one a custom job. But, Oberheim's intentions doesn't look like they were pushing it as a custom-made piece. I decided not to scan the small photo from the Spec Sheet - it just wouldn't do this synth justice. That thing is a beast and deserves a two-page advertisement just for posterity alone. But an ad with a big photo just wasn't meant to be - at least in CK anyways. But, as luck would have it, more than 30 years later Internet fans would have a chance to view one of these beasts through the magic that is YouTube. Another awesome photo of a BLACK dual manual Eight Voice has also been making the rounds on the Internet. I first ran into the photo below through the most awesome MATRIXSYNTH site, who found it through the also most awesome Vintage Synth Explorer forums long before I ever started lurking there. I've also seen the photo pop up in other forums too. Gorgeous. "I built it myself from parts purchased from Oberhiem directly. There was an employee purchase plan, where you could buy the part kits (all the pieces pulled from stock, and organized)." 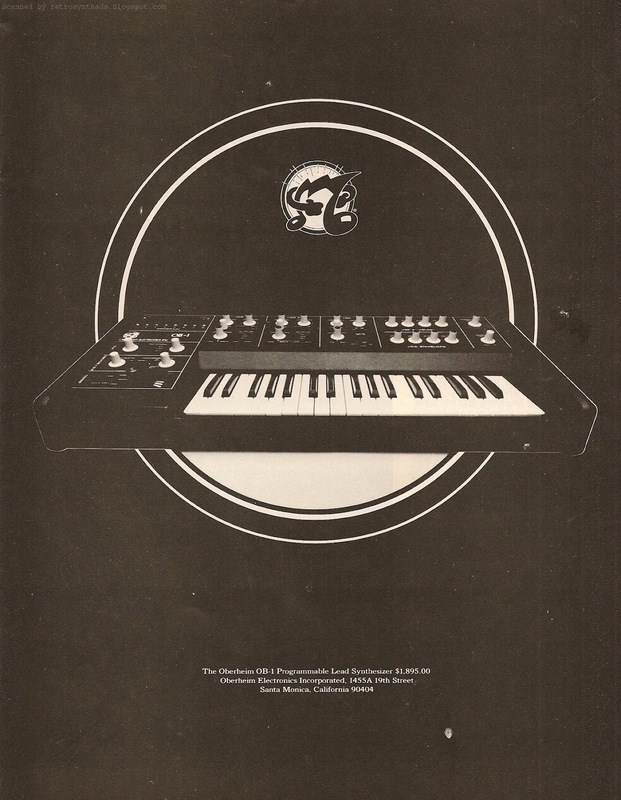 Sequential Circuits Prophet-5 1/2-page advertisement from page 155 in International Musician and Recording World July (UK)/August (USA)1978. Oh Rod! How much does your store love US synth companies! First "OBERHEIM month" - twice. And now July is the "MONTH FOR THE COMING OF THE PROPHET". And, not sure if the Prophet just didn't show up in July or not - but the ad appeared again in September declaring that it was the month that Prophet would show up. Either way - like I said in my last Rod Argent ad post on the Oberheim synths - good on ya for giving companies like Sequential Circuits and Oberheim some good advertising real estate in IMRW. 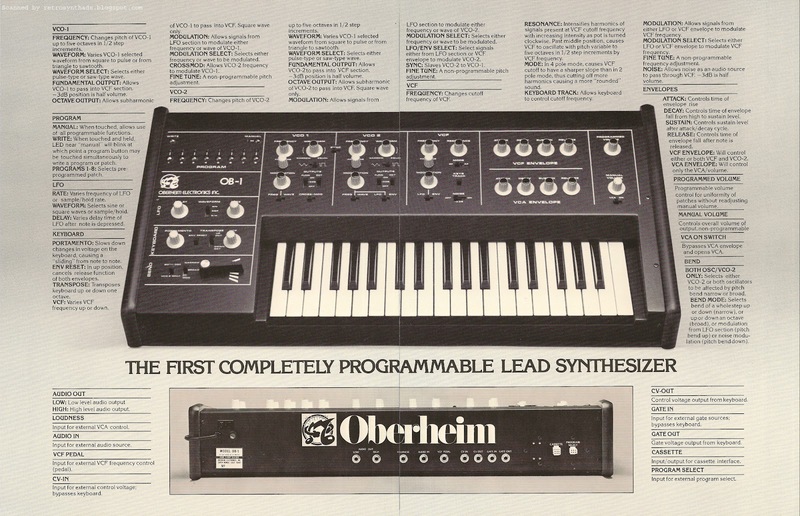 The ad template is very similar to the Oberheim advertisement, and in fact this template appeared quite frequently to promote the store in IMRW. For example, the same 1/2-page advertisement template appeared in the May issue of IM declaring May as R.M.I. month - "starring for the first time in the U.K. the RMI KEYBOARD COMPUTER - solely available from us". Great historical info! Side note: It seems Rod Argent was the exclusive distributor for a few synths in their time. As as I flipping through the Nov (UK)/Dec (USA) issue doing research, I noticed that the "Stand by for the Wasp invasion" ad mentions that Rod Argent's was the exclusive distributor in the UK. Similar 1/2- page Rod Argent ads in other months wouldn't focus on a particular piece of gear, but instead be very general in nature. The ad in the March 1978 issue of IM was just that - listing off a string of synths, electric pianos, organs and string machines by Moog, Yamaha, ARP, Korg, Yamaha as well as a few lesser known companies such as the Jeremy Lord SkyWave! Yum! This ad is also cool because it really helps pin down when exactly the Prophet made it on to UK soil. Promotion of the Prophet started in Contemporary Keyboard back in February 1978. 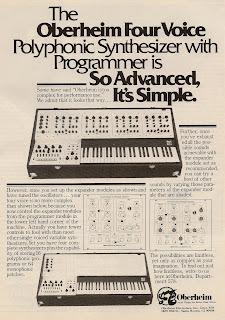 And this ad states that this synth is "solely available from Rod Argents Keyboards" in the UK. This seems to indicate to me that there was only a four or five month delay (tops!) before Dave Smith got that instrument across the pond. Not too shabby for 1978. And something I didn't mention in my previous blog post - you will find a small blurb at the bottom of this ad that states that Rod Argent carried Contemporary Keyboard magazines! Including back issues. Nice! Just like I mentioned in my previous Rod Argent advertisement, it seems that its not only me and Rod that are digging the Prophet-5 either. But this time, its not IMRW reviewer Dave Simmons that is reviewing the synth. It is none other than Robin Lumley from Brand X. In the review, Lumley doesn't hide his excitement over the Prophet too well. Okay - not at all. "Note the constant reference back to the famed little instrument from Norlin: this is because constant comparison to the Mini should be useful to you as a tern of reference, and also because for any instrument to be compared favourably to a Mini is a compliment to its ergonomics, its sound, and its satisfaction in operation." "Obviously, Sequential Circuits is going to lose a lot of prospective customers by withdrawing this version, but it's to their credit that they've not prepared to see anything that is slightly below their high standards." Near the end of the article, he mentions that his only two quibbles (I love UK-speak!) are the fact that it is only five-voice polyphonic, and the lack of triangle wave on oscillator 1. "Only the fairly slow arrival of the product into the UK is stopping a boom from occurring. If you are into synths, you must try the Prophet, and if you're not, try one anyways and you'll be converted for sure." Can't beat that kind of historical info. End note: One other thing I always find interesting about UK ads is the different credit cards that seemed to be available. 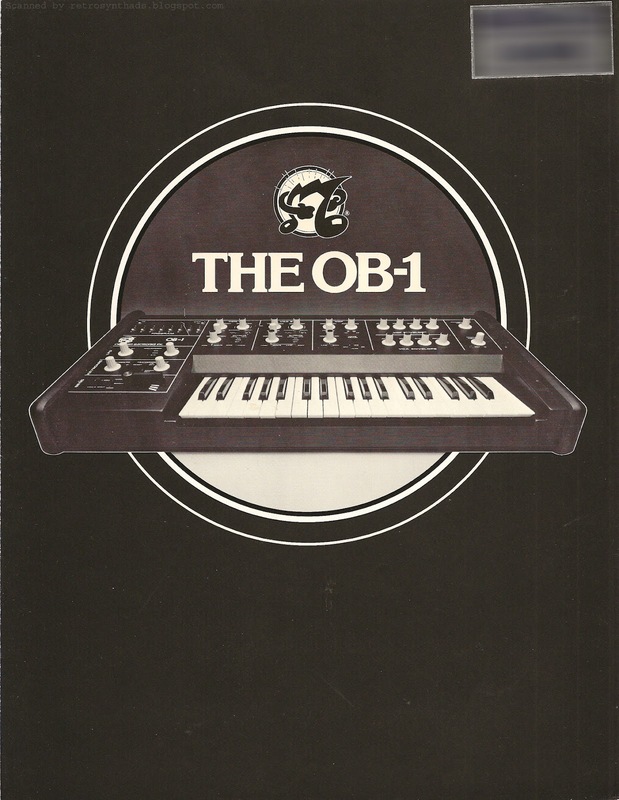 Oberheim OB-1 4-page brochure from 1978. Look familiar? 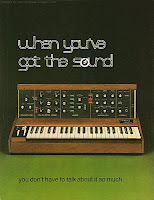 The cover of this brochure looks an awful lot like that December 1978 OB-1 advertisement that I just blogged about. Both the cover and that ad are simply rockin'! And, since there is no print date on this brochure (booooo!) the ad placement date (December 78) also helps pin down the print date. I'm guess that this brochure was created a bit earlier in 1978, and then turned into the ad for the December issue of Contemporary Keyboard.Just a hunch. I've noticed that if you click on the scanned images in my blog post, some browsers will open them up into pop-up window within the current window. If you have a normal-sized monitor, you really can't see the detail unless you shift-click on the image so they open up in a totally new window. And even then, most browsers will automatically shrink so they fit on the page - so another click on the image is necessary to see them in all their glory. This is especially true for the inside two pages of this brochure. To really see the detail on the front panel - you have to open it up in a new window and magnify it to full size. Only then do you really see details like the touch-sensitive contacts for the patches. Or that lever in the bottom right of the top panel used for bending. Or the detail in the knobs with their little ridges for gripping. I'm in love! The controls on this synth are just laid out so nicely. That front panel is the perfect balance of space and controls. And the back panel, sometimes shrunk down considerably in other brochures, is actually viewable at a decent size. Extra points there too! Those two middle pages also really provide some good detailed technical information about the machine. A good read if you are really interested. Same goes for the back page. I'm not a fan of reading white text on a black background. But in this case I really don't mind. The text is big enough that I don't even have to use my reading glasses. It's not so much the size of the text but the thickness. Oberheim OB-1 programmable lead synthesizer "Holiday '78" 1-page black and white advertisement from page 25 in Contemporary Keyboard December 1978. Hey - check it out. It's my new fav! This Oberheim advertisement oozes confidence. Tough. Simple. Effective. The ad is printed on the page from edge to edge with a background that is black as night - and I tried to scan in as much of it as possible to keep all the elements of the ad in perspective to the magazine page size. Most awesome is that the front of the synthesizer is printed large enough on the page that you can still make out some of the control labels on the instrument. And the name of the instrument. The larger circle behind the OB-1 is really just a duplication of the circle in the Oberheim logo, but as a whole, to me the design resembles a very modern Christmas wreath - which makes sense since this ad seemed to only appear once in the December 1978 issue of Contemporary Keyboard. Not sure if that was intentional or not, but it makes this ad even cooler than it already was. The only thing that lets this ad down is the small writing at the bottom. I just don't think Oberheim needed to include it. Much like the name "Oberheim" itself, by this time Oberheim's visually striking logo was already a legend, instantly recognizable throughout the world of synthesizers. So, unless that $1,895.00 price tag was a significant drop from the past, I just don't see a reason to include this information. This was hardly the first ad for the OB-1. We had already seen the OB-1 in its own introductory "Programmer technology in a lead synthesizer" ad in late 1977 as well as a guest appearance in that 360 System "Live Performance" Slavedriver ad from early 1978. I guess my point is that the imagery used in this ad stands on it's own. No text required. But in the big picture of things, that text is such a small detail that I don't think it takes away from the overall effectiveness either. In fact, I'm gonna throw it out there that this ad is on par with those two similarly ballsy Minimoog ads that I'm always going on about. Those two ads (below) included minimal text as well, letting the recognizability of the instrument speak for itself. Incredibly, before now, I've never noticed that this Oberheim ad showed up in CK *BEFORE* these two Moog ads - which as far as I can tell started to appear in Contemporary Keyboard in July 1979 and September 1979, respectively. 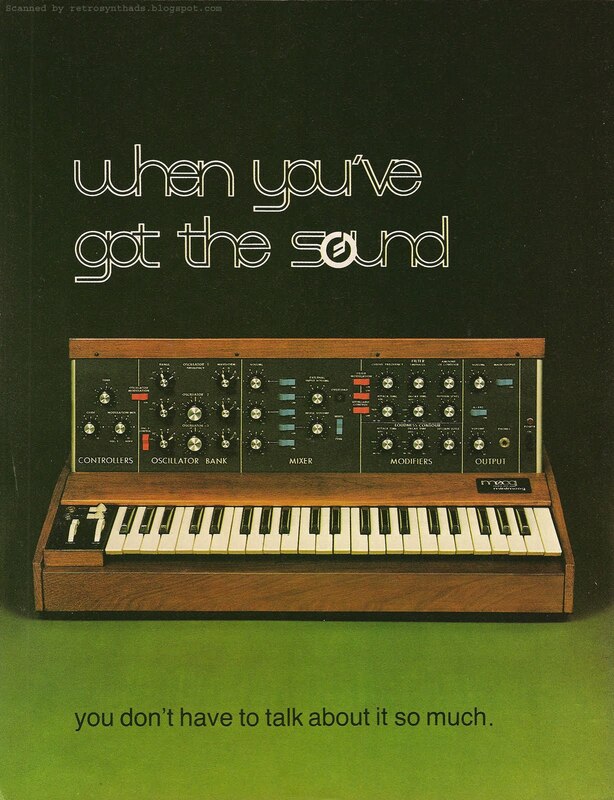 That first Minimoog ad is still my favorite though because Moog didn't even have to show the front of the synth and *everyone* still recognized the ad's feature piece of gear based only the font and the form-factor of the synth alone. But still, I gotta bow down to Oberheim's ongoing coolness! Oberheim FourVoice and OB-1 1/2-page advertisement from page 197 in International Musician and Recording World June (UK)/July (USA) 1978. Um... this is sad. I seriously never made the connection between Rod Argent - keyboardist for the band The Zombies, and Rod Argent Keyboards - the store in the UK that printed a wack of ads in International Musician and Recording World in the late 70s. In my defense, I hadn't been born yet when The Zombies were around. But my brother had rightfully introduced me to the band at an early age, and they had a large influence in my early music experiences. After The Zombies, Argent went on to form the highly descriptively named band Argent, which was active until around 1976. And then he continued on to do a number of other projects. When I started Googling his name as part of the research for this ad, search results had pretty much convinced me that the band member and the shop owner were one in the same, but it took a bit to find some kind of evidence of this fact. The Zombies page on Wikipedia didn't including any reference to a keyboard store. And neither did Rod Argent's own Wikipedia page. But I finally found one small sentence on the Argent (The band) page that backed up this theory - and this sentence also included a bit of history on another one of my early favs - The Kinks! That page states that when the band stopped performing in 1976, other members "briefly continued together under the name Phoenix before going their separate ways, with first Rodford and then Henrit becoming members of The Kinks. Meanwhile, Rod Argent went on to work with Andrew Lloyd-Webber, and to produce a couple of solo albums. He also opened a keyboard shop in the West End of London". Bolding is mine - interesting stuff. And, leads me to believe this is Rod Argent of The Zombies' keyboard shop. Now, one might get excited to know that Rod Argent himself declared June "OBERHEIM month" at his store - the line in the ad is in quotations, so I'm assuming Rod himself declared this. But then, two months later, you may not get so excited to know that International Musician included the exact same advertisement with only one change - "June" was changed to "August". Yup - Rod had once again announced that the month of August had also been selected as another "OBERHEIM month". Don't get me wrong. Oberheim deserves as many months as possible in a given year dedicated to it. And I dig the fact that Rod Argent was also digging Oberheim synthesizers enough to import and promote them on their own in an ad. And, it turns out that Rod and I aren't the only ones digging Oberheim synthesizers. Reviewer Dave Simmons also took a bit of a liking to the OB-1 in his August 1978 "Simmons' SynthCheck" review in International Musician. "The OB 1 is made in America by Oberheim Electronics Inc. and is one of the "new breed" of synthesizers which have memories i.e. a particular sound can be stored away, to be recalled instantly at the press of a button. this, to my mind, is the ideal type of synthesizer - fully variable but with a number of pre set sounds, each of which can be set up to the player's own taste (You're not lumbered with someone else's idea of what a trumpet should sound like.)" The rest of the article is logically organized by standard synth programming sections - a few paragraphs on the VCOs, VCF, EG and VCA, as well as small sections on programming, manual controls, and the general layout of the machine. And of course, also included in a call-out box and one of my favorite bits of reference information - price! 1,240 pounds or 2,500 US dollars in 1978 dollars. "It does all that you would expect from a single voice, lead-line synthesizer and is not much more expensive than one without the memory". So, good on Dave Simmons! And good on Rod Argent! BTW - Rod's official Web site tells me he is currently touring. I apparently missed the Canadian leg of his tour, but would really try and catch him if he ever came close again. He is also twittering under the handled @zombierodargent. Oberheim FourVoice 1-page synthesizer and programmer advertisement from page 47 of Contemporary Keyboard magazine September 1978. Okay... where was I.... oh yeah. In my last blog post, I realized that I had a bit of a gap in my Oberheim blogging - mostly between 1979-1981. So, to help myself get back into Oberheim territory, I decided I needed to do a bit of a review. I started by covering off a few loose ends while reviewing Oberheim's early advertising history in CK and Synapse through 1976, ending with the September/October "Ultimate Keyboard Machine" ad. At the end of 1976, Oberheim came out with an ad that nicely played off the previous "Ultimate Keyboard Machine" ad. The full ad-title of this new ad that appeared in the November/December 1976 as well as the February issue of Contemporary Keyboard was "Stepping stones to the Ultimate Keyboard Machine", which promoted the Synthesizer Expander Module aka SEM. Hence the "stepping stone" reference.Oberheim made a great argument that you could build up your synth addiction in small steps, all the way up to the EightVoice with the programmer option. Nice! That February issue of CK also included the Spec Sheet promo for the Programmer - which I highlighted in that "Ultimate Keyboard Machine" post. Meanwhile, in Synapse magazine, Oberheim - either on purpose or not - didn't advertise in the November/December issue, instead managing to make appearances both in the "What's Happening" and "Equipment Review" sections. If you guessed those appearances were "Programmer"-related, you'd be right. 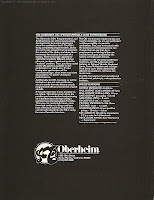 Oberheim actually received the honor of kicking-off the "What's Happening" section with "Oberheim Electronics will so be releasing an A/D, D/A converter so that patches can be stored on audio cassettes ad called up when needed, adding greater flexibility to their Polyphonic Synthesizer Programmer...". "It can honestly be said that this is the most revolutionary new instrument on the market." You can't buy that kind of advertising! The rest of the review is very factual, listing off the programmable parameters of the unit and other features. The review ends with a bit of a dig at Oberheim, along with some great historical pricing info - and not just for the PSP-1! "For all this magnificent technology, however, an equally magnificent price must be paid. The PSP-1 by itself retails for $1395. A programmable four-voice system costs $5390; an eight-voice is $9785." March and April 1977 were quiet months for Oberheim, but they came back swinging in the May issue of CK and the May/June 1977 issue of Synapse with their "Unquestionably the best" ad. Along with this hard-hitting ad is also CK's interview with Tom Oberheim, which I highlighted in the blog post. "The DS-2A Digital Sequencer stores melodic/rhythmic sequences (which are played on a synthesizer keyboard) in its memory and plays them back automatically. Playback speed is variable, and pitch remains constant despite tempo variations. Sequences of up to 144 notes can be stored in the unit's memory, and different combinations of number sequences can be fed into the machine. For example: one sequence of 96 notes and one of 48 notes can be stored together and recalled by pressing the appropriate buttons; or three sequences of up to 48 notes each can be stored; and so on. Each note in a sequence can have a duration of about 1/20 of a second up to eight seconds, and synthesizer keyboards with up to 61 notes can be used to program the unit. The machine is compatible with all major brands of synthesizers." That's gold, baby. Gold I tell ya! And probably the place many musicians first heard about the specs of this rare machine. The July 1977 issue of CK and the July/August 1977 issue of Synapse featured one of my favorite Oberheim ads. Titled simply "Evolutionary" (an extremely short ad-title by Oberheim standards), this ad not only promotes what Oberheim has accomplished, but also hints at what is coming in the near future. Gah! Looking at it again just now makes me do the happy dance! That July/August 1977 issue of Synapse also included another appearance by Oberheim - and again, not the synthesizer or the programmer - but the DS-2A sequencer. It appeared, along with three other sequencers (Sequential Circuits Model 800, EMS Synthi Sequencer 256, and the Thinc MMC-1) in a nice little round-up piece.A gooder. In the September 1977 issue of CK, Oberheim opted to run the "Stepping Stones" ad again, which hadn't been seen for six months or so. And then they went silent again in October. And, in fact, that is the last you would hear from the SEM/Two/Four/Eight-Voice crew until May/June 1978 issue of Synapse, when this "So advanced, its simple" ad would appear. 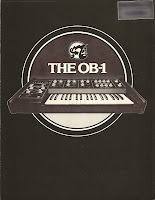 That's because in the meantime Oberheim had a new kid on the block to promote - the OB-1! This introductory ad for the OB-1 titled "Programmer technology in a lead synthesizer" made it's first appearance in November 1977, and ran intermittently until April 1978. The ad also made appearances in Synapse magazine in the November/December 1977 issue, as well as the January/February and the May/April 1978 issues. 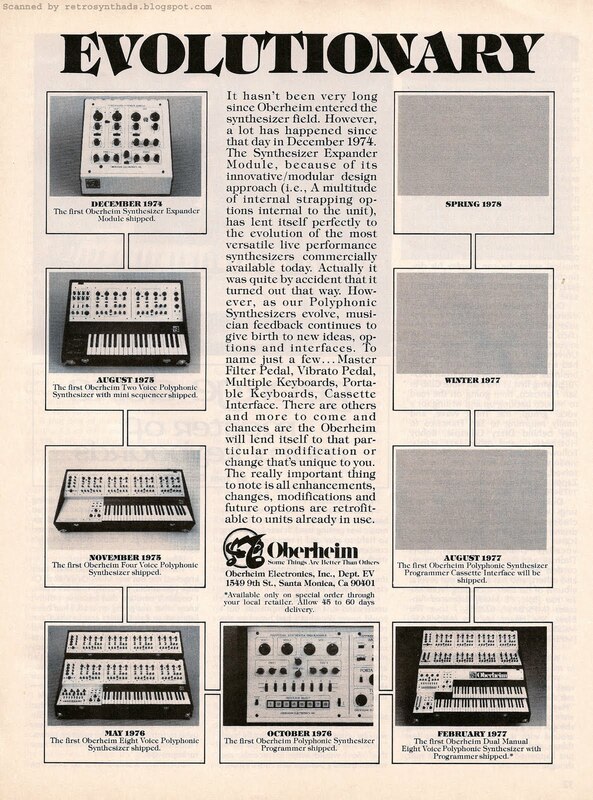 Oberheim also gets bonus points during this time period because the OB-1 also made a guest appearance in a 360 Systems Slavedriver guitar synthesizer ad that appeared during the winter of 1977 in Synapse. And then... finally - this "So advanced, its simple" ad made one last appearance in the July 1978 issue of CK. But now I can continue on blogging about Oberheim. I promise something new next time.